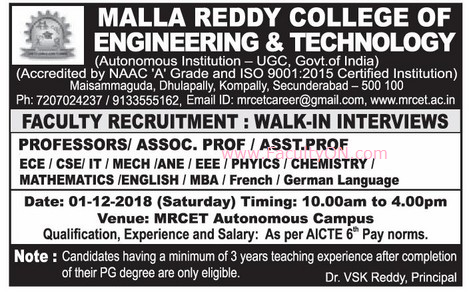 Malla Reddy College of Engineering and Technology, Secunderabad has advertised for recruitment of Teaching Faculty- Professor / Associate Professor / Assistant Professor jobs vacancies. Interested and eligible job aspirants are requested to walk-in on 01st December 2018. Check out further more details below. About College: Malla Reddy College of Engineering & Technology (MRCET) is a constituent College of Malla Reddy Group of Institutions (MRGI) established in 2004, Approved by AICTE, New Delhi and Affiliated to JNT University, Hyderabad. The College offers Engineering courses (B.Tech.) in ECE, CSE, AE, and IT disciplines and Post Graduate (M.Tech.) courses in ECE, CSE and AE specializations in addition to MBA and MCA programmes. The College campus with its aboriculture and horticulture is situated away from the hustle and bustle of the city provides a serene and tranquil atmosphere, which is conducive to both teaching and learning processes. How to Apply: Interested and eligible candidates are requested to attend the Walk-in interview by bringing their CV along with originals & copies of certificates and PP size photos to the walk-in address given below.